RJC Yacht Sales & Charter announces the sale of 80' Lazzara, DANCIN! 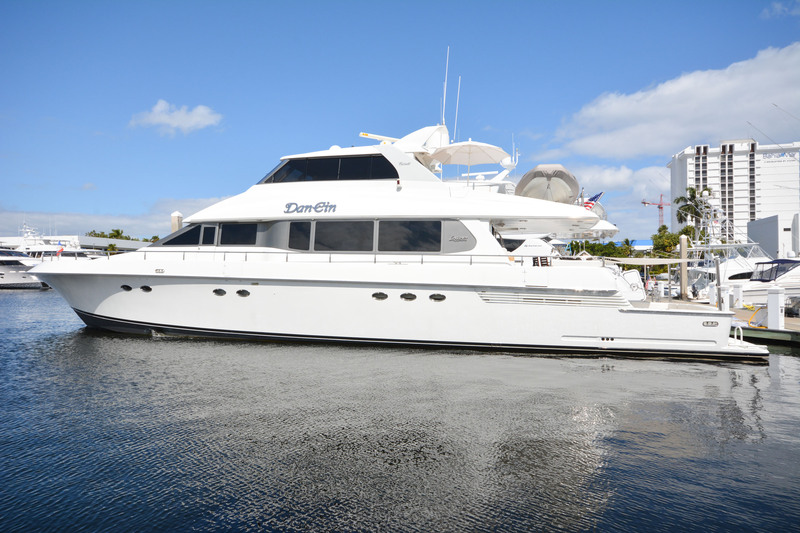 This 80' 2000 Lazzara MY, DANCIN has been sold and is now renamed ON THE LINE. Bob Cury at RJC Yacht Sales & Charters represented both buyer and seller less than 30 days after the yacht came on the market. Built in GRP by US yard Lazzara DANCIN was delivered in 2000 as an enclosed flybridge yacht. Accommodation is for eight guests in four cabins consisting of a master suite with a king sized bed and built in settees to port and starboard, two VIP suites and a twin, all with entertainment centres and en suite bathroom facilities. In addition, there are quarters for three crew. An interior with camphor wood paneling and lacquered joinery contrasts with earth toned carpeting to create a rich and welcoming ambience throughout while custom fabrics are used on all soft furnishings and bedding. The saloon is fitted with an L-shaped settee, two upholstered barrel chairs, a bar with a wine cellar and an entertainment centre including a large satellite television screen. A dining area forward has seating for six guests around a circular glass table and there is a custom overhead soffit with concealed lighting. Further forward still is a well equipped galley containing a raised breakfast nook with leather seating and a drop down television, ideal for casual snacks during the day. The enclosed flybridge features the Cabriolet option, giving the ability to convert it into an open bridge configuration. There is a helm station, a raised settee and a bar while all the windows can be opened for some welcome fresh air. Twin MTU 1,100hp diesel engines have logged only 400 hours since a W-5 overhaul and power her to a cruising speed of 24 knots and a range of 1,570 nautical miles at 12 knots.